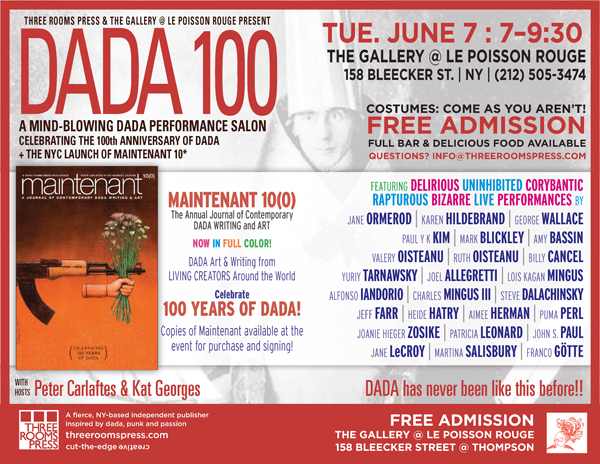 plus a celebration of the 100th anniversary of DADA. The event includes the NYC launch of the internationally-renowned MAINTENANT 10: Journal of Contemporary DaDa Writing and Art (2016, Three Rooms Press), a celebration of DADA inspired by this year’s theme WARM/HUNGER, featuring more than 170 visual and literary works by artists and writers from around the world, in full color. Featured performers include contributors to this year’s journal engaging in a variety of dada performances and live art installations. Three Rooms Press co-directors and New York-based performance artists Peter Carlaftes and Kat Georges will host. The event takes place Tuesday, June 7, 7-9 pm at Le Poisson Rouge, 158 Bleecker Street (at Thompson), New York. Costumes encouraged. Admission is free. For additional information and reservations, email info@threeroomspress.com. Jason Abdelhadi, Tomomi Adachi, Derek Adams, Henrik Aeshna, Jamika Ajalon, Linda J. Albertano, Jan Michael Alejandro, Joel Allegretti, Avelino De Araujo, Greg Bachar, Alice Bag, Aditya Bahl, Zata Banks, David Barnes, Amy Bassin, Mary Beach, Beate Bendel, C. Mehrl Bennett, John M. Bennett, Volodymyr Bilyk, József Bíró, Sergey Biryukov, Rabyn Blake, Mark Blickley, Dianne Bowen, John Bowman, Gedley Belchior Braga, Bob Branaman, Fork Burke, Irene Caesar, Glen Calleja, Billy Cancel, Angela Caporaso, Peter Carlaftes, Mona Jean Cedar, Neeli Cherkovski, Peter Ciccariello, Hal Citron, Lynette Clennell, Andrei Codrescu, Giuseppe Colarusso, Roger Conover, Karen Constance, Tchello d’Barros, Steve Dalachinsky, Arturo Desimone, Cathy Dreyer, Kip Duff, Agneta Falk Hirschman , Jeff Farr, Becky Fawcett, Bartolomé Ferrando, Luc Fierens, Giovanni Fontana, Kofi Forson, Michael T. Fournier, Thomas Fucaloro, Ignacio Galilea, Armando Jaramillo Garcia, Maria Garfjell, Kat Georges, Christian Georgescu, Franco Götte, S. A. Griffin, Rebecca Griffin, Fausto Grossi, Janet Hamill, Grant Hart, Alamgir Hashmi, Heide Hatry, Aimee Herman, Karen Hildebrand, Jack Hirschman, Mark Hoefer, Bob Holman, Laura Tringali Holmes, Joel Hubaut, Alfonso Iandiorio, Jonathan Peter Jackson, Ruud Janssen, Mathias Jansson, Dobrica Kamperelic, Susan Keiser, Paul Y.J. Kim, Antonia Alexandra Klimenko, Doug Knott, Mark Kostabi, Ksenija Kovacevic, Dylan Krieger, Hope Kroll, Žygimantas Kudirka, Edward Kulemin, David Lawton, Pascale Le Bihan, Jane Lecroy, Marc James Léger, Patricia Leonard, Patrice Lerochereuil, Alexander Limarev, Emily Linstrom, Frédéric Lipczynski, Gerard Malanga, Sophie Malleret, Djelloul Marbrook, Laurent Marissal, Malak Mattar, John Mazzei, Jim McHugh, Philip Meersman, Iulia Militaru, Lois Kagan Mingus, Charles Mingus III, Richard Modiano, Mike M. Mollett, Dustin Luke Nelson, Alexandre Nodopaka, Dylan Nyoukis, Ruth Oisteanu, Valery Oisteanu, Suzi Kaplan Olmsted, Marc Olmsted, Jane Ormerod, David Ishaya Osu, Eiko Otake, Bibiana Padilla Maltos, Lisa Panepinto, John S. Paul, Claude Pélieu, Puma Perl, Pawel Petasz, Raymond Pettibon, Charles Plymell, Roxie Powell, Renaat Ramon, Janaki Ranpura, Kathleen Reichelt, Johann Reißer, Mado Reznik, Weley Ricket, Bill Roberts, Jerome Rothenberg, Martina Salisbury, Phil Scalia, William Seaton, Silvio Severino, Susan Shup, Elly Simmons, Pere Sousa, Thomas Stolmar, Richard Stone, W.K. Stratton, Phantom Street Artist, Daina Surrealism, Yuriy Tarnawsky, Neal “Skooter” Taylor, Richard Tipping, Ted Tollefson, John J. Trause, Jürgen Trautwein, Ann Firestone Ungar, Jon Andoni Goikoetxea Uriarte, Nico Vassilakis, Duska Vrhovac, Anne Waldman, George Wallace, Scott Wannberg, Mike Watt, Poul Weile, A. D. Winans, Larry Zdeb, Ali Znaidi, and Joanie Hieger Fritz Zosike.